The RedSDK Plug-in for TurboCAD 2018 enhances the program’s lighting, luminance, and photorealistic rendering capabilities for more robust, high powered renders. This plug-in integrates directly with the TurboCAD 2018 material editor and Desgin Director. Appropriate for TurboCAD release 2018. TurboCAD 2018 offer a powerful rendering engine for quick and easy presentations of your design. 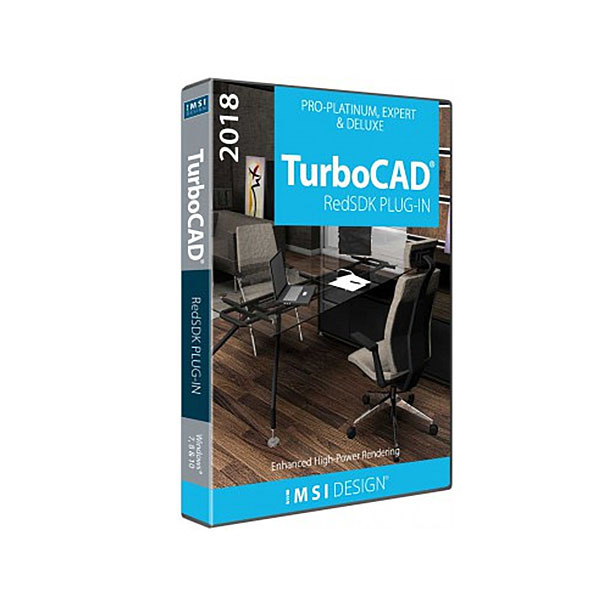 For customers looking for more rendering options, the RedSDK Plug-in for TurboCAD 2018 enhances the program’s photo-realistic rendering capabilities with even more robust, high power rendering. 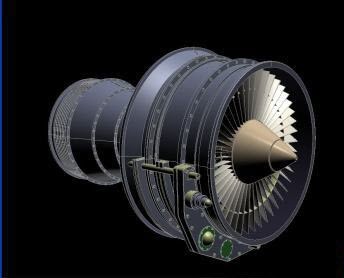 Integrates directly with the TurboCAD material editor after installing. 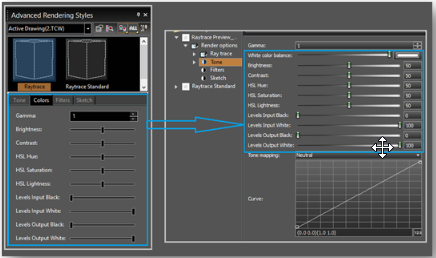 New post-processing controls and filters. The RedSDK Plug-in for TurboCAD 2018 integrates directly with TurboCAD’s material editor. It also provides numerous shaders to create materials and their finishes with a real-time preview. This is available even on a selection from the model instead of just a simple cube or sphere (also available). 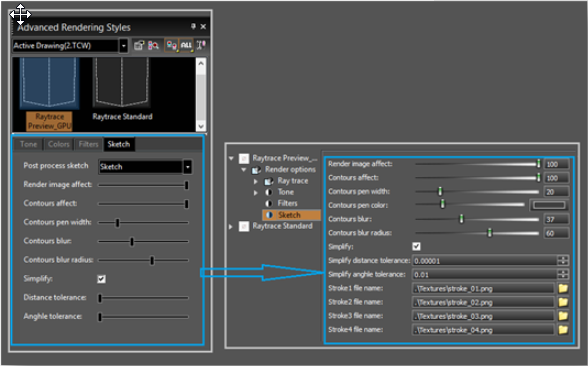 When creating or altering materials, there are extensive descriptions of each shader in the dialog window to simplify each step. There are over 500 materials included, with the ability to create hundreds custom Colors, Materials, and Effects to extend your rendering capabilities. The RedSDK material library is a complete library of pre-defined materials for use with RedSDK. All materials are defined using high resolution textures and are ready to use for photo-realistic needs. In addition, many materials also exist in 'real-time' configuration for advanced interactive renderings. The generic material is intended for good quality/speed ratio visualization. It features what most people would expect from a all-purpose material. 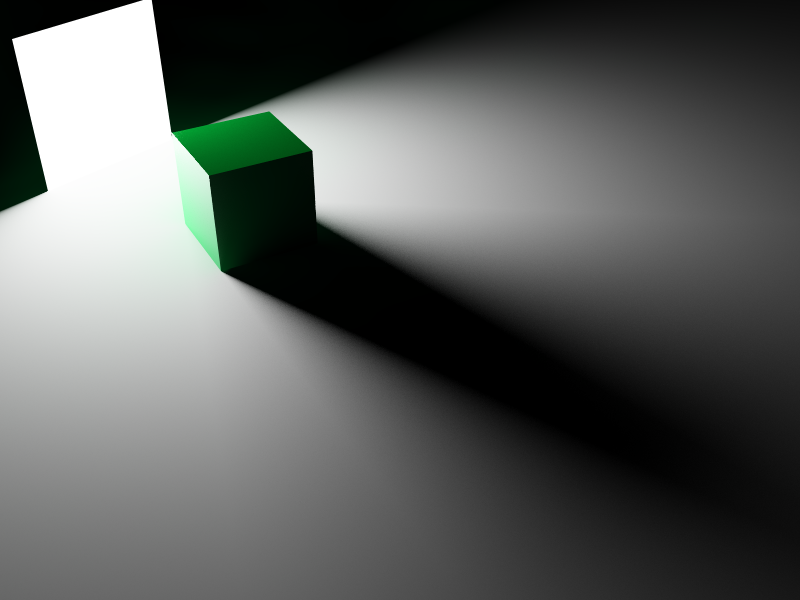 Improvements on the rendering quality & performance: Enhanced multiple importance sampling, Enhanced probabilistic light sampling and Adaptive ray-tracing. 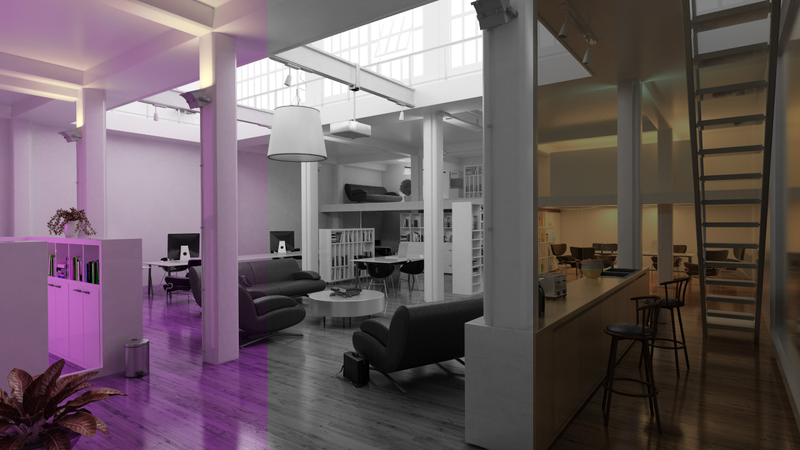 Extensions of the post-processing capabilities of RedSDK: New post processing features. Real-time rendering enhancements: Real-time improvements. Engine enhancements: Debug output for a better error tracking. New features such as Clouds. Some hardware changes Hardware issues. New methods used for multiple-importance sampling calculations in RedSDK 4.3. This results in much better results. The image above compares results got from RedSDK 4.2 with new results got from RedSDK 4.3. All rendering options are identical and rendering times are identical too. It reduces the burden of rendering scenes with many lights by improving the probabilistic distribution of lighting samples. On average, scenes render faster AND get a better quality with less noise. 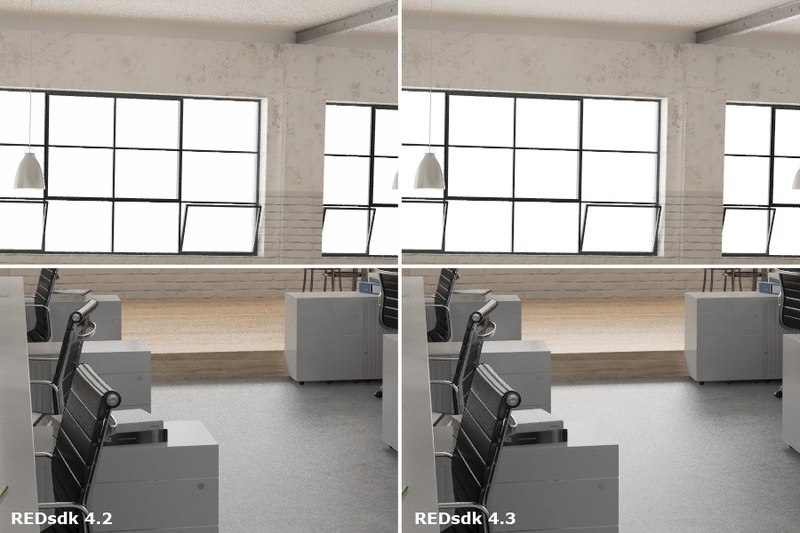 Please see the improvement in RedSDK 4.3 with identical rendering parameters on an average scene (6 millions triangles, 25 lights, 200 materials): AA = Anti Aliasing level, L = Lights sampling rate, G = glossiness sampling rate. 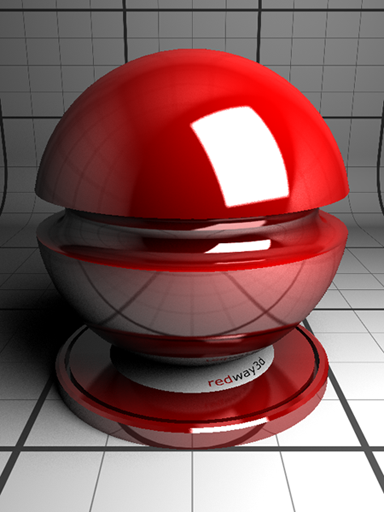 RedSDK features a new rendering mode based on adaptive sampling for ray-tracing. With Adaptive sampling user can reduce the amount of calculation to perform for a pixel based on a quality threshold. Performance savings can reach up to 75% of the rendering time, at the expense of a little loss in quality. As a result, we get an image with a variable noise level per pixel, that depends on the frequency of the phenomenon we have to sample (reflections, shadows of tiny objects, etc...). Input / output levels controls. All these effects are available in all RedSDK modes: hardware, hybrid or software. Portals are now visible and rendered by the GPU. Portals are considered as physical lights and are converted to the GPU as any other physical light. IES profiles are now visible and rendered, with no associated performance cost. True volumetric clouds: detailed in the tutorial Rendering volumetric clouds, that are 'in-scene' clouds that can interact with other user geometries. These clouds are rendered using the volumetric rendering solution of RedSDK. Background clouds: These clouds only exist in the background sky image of RedSDK. These clouds are based on artistic texture plates that are provided by REDWAY3D and are much simpler to use than volumetric clouds and have more intuitive controls. The NVIDIA threaded optimization has been disabled for all NVIDIA drivers on starting a RedSDK application. This threaded optimization could cause application crashes. The occurence was low but significative enough to let us disable this option. As soon as this issue gets fixed we'll enable the threaded optimization again. On recent INTEL HD graphics, we had several customer application issues reporting a loss in rendered frames (the application window is not refreshed sometimes, even if rendered properly). This has been countered by setting the value of the RED::OPTIONS_DATA_RELEASE_TIMER to INT_MAX as the new default in RedSDK 4.3. Practically, this means that RedSDK does not release intermediate rendering buffers it uses and keeps a pool of buffers ready to be reused in case of need. As nowadays GPUs have a large amount of video memory available, we don't think this'll cause any problem. We have modified the primary GPU detection method, as a result of incorrect values that could be returned by Windows EnumDisplayDevice call (mainly dual GPU Optimus systems with NVIDIA / INTEL GPUs). The new method is OpenGL based, so its result should always match the real GPU used by RedSDK.